A terrible day for election forecasters. Where are the winners? The 2016 presidential election result may well be one of the biggest upsets in the history of election forecasting. Usually, after an election, people look for the best forecasters. This time, it’s hard to find anyone who got it right, us included. Regarding the Electoral College, PollyVote combined state-level forecasts from 20 different sources, none of which predicted Trump to win a majority of electoral votes. Now, people are pointing to the fact that some models did in fact predict Trump to win, such as those by Alan Abramowitz or Helmut Norpoth. One lesser known story : @AlanIAbramowitz forecast model said GOP shd win but he refused to believe it bc of “Trump factor”. It was right. Yet, these models predicted Trump to win the popular vote, which, according to the latest projections, he most likely won’t. Norpoth’s model, for example, predicted Trump to gain 47.5% of the two-party vote and thus might miss by about three points, which is a larger error than most of the other econometric models will end up with. So are there any winners? Well, you could look at the individual models’ vote share predictions to judge their accuracy. For example, Jim Campbell’s well-known trial-heat model predicted Clinton to gain 50.7% of the vote and might thus be very close. But then, these models don’t provide us with the most important information of who will become president. So, no winners in sight. Author Andreas GraefePosted on November 9, 2016 November 9, 2016 Categories accuracy evaluation, Post-mortem1 Comment on A terrible day for election forecasters. Where are the winners? Based on the latest results, Donald Trump won the election with 305 electoral votes (vs. 233 for Hillary Clinton). Most likely, the final outcome will show a split between the Electoral College and the national popular vote. The New York Times currently projects that Clinton will win the popular vote by 1.3 percentage points. These results are a major upset for the PollyVote and other election forecasters, as virtually no one saw this coming. The Electoral College outcome came at a big surprise. The PollyVote’s final Electoral College forecast predicted Clinton to win 323 electoral votes, compared to 215 for Trump, which was very much in line with other forecasters. For these state-level forecasts, the PollyVote combined predictions from eight poll aggregators, five models, four sources of expert judgment, two prediction markets, and one source of citizen forecasts. Not a single one of these twenty different sources predicted that Trump would win a majority of the electoral votes! Accordingly, the combined forecast failed as well. The final PollyVote forecast predicted Clinton to win the popular vote by 5 percentage points, 52.5% vs. 47.5%. Based on the latest projections, Clinton is expected to win the popular vote by about 1.2 points, which would translate to about 50.6% of the two-party vote. If these numbers are correct, the PollyVote will have missed by 1.9 percentage points, which is more than three times the average error from previous elections. However, the accuracy of forecasts shouldn’t just be judged based on final predictions. Rather, one should look at which forecasting method has performed best over the course of the campaign. The relative accuracy of the different methods changes as we get closer to the election. 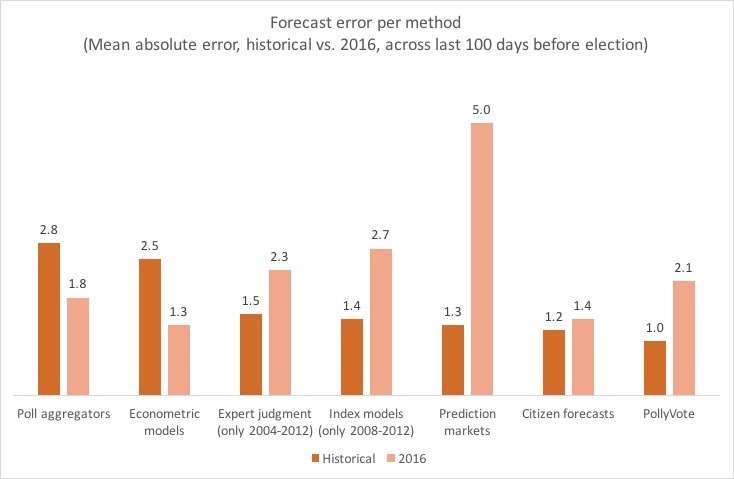 For example, the average of econometric models became more accurate, whereas the accuracy of citizen forecasts decreased somewhat. It’s been a long night and it’s still too early to draw conclusions. But Polly the forecasting parrot feels miserable about her miss. While she did of course perform as well as the typical forecast – which is the minimum what you would expect from a combined forecast – she did not outperform the best individual method as in previous elections. We will work hard to find out what went wrong and what information we missed in order to provide her with even better information next time. But a look at the method’s relative accuracy in predicting the vote shares provides some interesting first insights. Prediction markets, which were among the most accurate methods historically, experienced a huge error. In contrast, econometric models, which were among the least accurate methods over the last six elections, outperformed all other methods in 2016. Yesterday, probably no one – us included – would have thought that the econometric models component would turn out to be most accurate. Some forecasters didn’t even trust their own models. Others used the models’ forecasts only as a benchmark to estimate how many votes Trump would cost the Republican party. The accuracy of different methods changes over time and across elections. There is simply no one best method to predict elections. 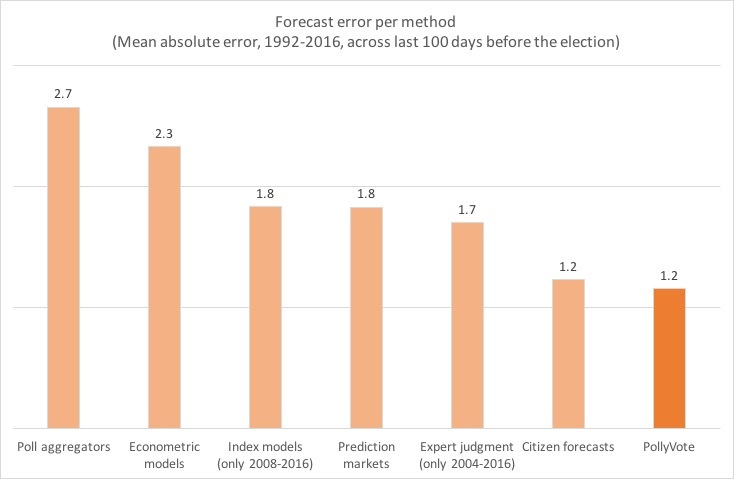 The methods’ relative accuracy for forecasting an election strongly depends on the context and the idiosyncrasies of that particular election. It’s very difficult to determine a priori which method will provide the best forecasts. This is also why it makes little sense to weight forecasts based on their historical accuracy, particularly in applications such as election forecasting, where we have limited historical data to derive valid estimates about the method’s relative performance. This is why Polly’s method of combining different forecasts is still valuable, and perhaps even more important in the future. First, it’s generally not a good idea to trust any single forecast. Second, in aggregating all the different forecasts that are out there, the PollyVote enables us to learn about the accuracy of the various methods – and the biases they may entail – over time. If we can better understand the conditions under which different methods work best, we might be able to use this information to improve the accuracy of our combined forecast and to better estimate its surrounding uncertainty. In fact, estimating uncertainty is one of the most interesting areas for future research when it comes to combining forecasts. We will provide additional analyses and thoughts over the next days and weeks. So stay tuned.